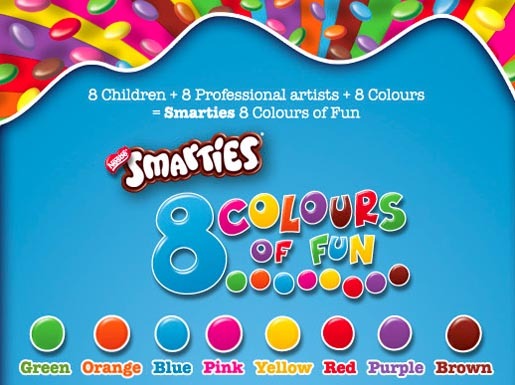 Nestlé Australia is promoting Smarties chocolates in an integrated advertising campaign, “The 8 Colours of Fun”, aimed at children and their parents. Eight children, one for each Smarties colour, are paired with eight adult artists, commissioned to create a work of art inspired by their designated colour. The campaign is online at Facebook and YouTube. Read on for Blue, Pink, Red, Yellow, Orange, Brown, Purple and Green. The Smarties Facebook page includes a downloadable how-to guide with instructions for a color-related DIY art project for children. The 8 Colours of Fun campaign was developed at JWT Sydney by executive creative director Angus Hennah, creative team Simon Armour and Blair Kimber, account team Paul Coles, Fiona Tenaglia and Anna Swinburne. Filming was shot by director Summer Agnew via Curious Film, Sydney. Post production was done at FSM, Sydney. Sound was produced at Nylon Studios, Sydney.